Erin Burrell has endured challenges beyond what any young, energetic, intelligent person typically encounters. For over two years, she tolerated working at a business that restricted her duties, including simple, ordinary tasks that Erin was fully capable of completing, such as serving hot beverages. As well, she internalized the humiliation of wearing a label on her vest, in large, block letters that broadcasted "I AM DEAF." Erin suffered through this experience because of unjustified safety concerns by the business and Erin's patient desire to prove her value and abilities. Finally, Erin realized she was not being respected for her exceptional contributions to her job and came to the CHS Employment Services Program for support in challenging her employer. After extensive Human Rights investigations, and thorough consideration of the possible opposing angles that the employer might take, Erin, with the CHS Employment Consultant beside her, presented her case to the manager of the corporation. Erin was meticulous and professional, adding personal elements that displayed how vulnerable these issues made her feel. By the end of the meeting, Erin was no longer required to wear the vest. As well, she was granted the opportunity to be able to complete the tasks she had always been capable of doing, along with her coworkers. 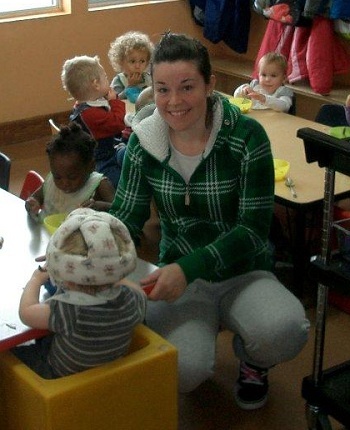 Within two weeks after the successful meeting occurred, Erin was offered a job as a Daycare Provider at Little Rascals Daycare in Belleville. Erin resigned from her old job with a great sense of pride that she left behind a changed environment with improved attitudes. This time, her employers were intrinsically supportive, open minded and fully inclusive. The owners of Little Rascals, Pam and Cheryl, had previously hired other Deaf staff through CHS Employment Services. They embraced Erin's individual qualities, skills and contributions immediately. However, as with any new staff member there have been growing pains at Little Rascals throughout the years. Pam and Cheryl have commented that "without CHS's immediate availability, expertise and ongoing encouragement, the success of the placements could have resulted in less favorable outcomes. CHS bridged the culture gap when we weren't aware there was a culture in the first place! As well, Interpreters have been a great communication resource, but it has been the Employment Consultant that has ensured employment is maintained, concerns or questions are resolved and knowledgeable support is provided." Some parents initially panicked about communicating with a Deaf staff person, not knowing how to present their concerns or share information (resolved by Pam and Cheryl empowering the parents and consistently reminding them to treat the Deaf staff as they would any other person. Encouraging them at all times to inquire and respect each Deaf staff person's communication preferences). All children, infants and staff are expected and encouraged to learn sign language at the daycare. Sign language is used at all times when a Deaf staff person or child is in the vicinity. Deaf staff have been successfully teaching infants as young as 6 months old to communicate with sign language, thereby inadvertently encouraging parents, siblings and the community to learn it as well. All deaf staff need to have their body positioned facing the children at all times to ensure full safety as well as effective communication. Visual alarms are being installed throughout the interior of the building. This will ensure that any deaf and hard of hearing children or adults will be notified of any immediate emergencies. Erin continues to flourish in this environment that fosters a mutually respectful and inclusive relationship with all individuals. She is delighted at the opportunity to focus on her job, rather than how to deal with the stigma, humiliation and frustration of being oppressed. She develops programs, teaches, supervises and contributes to a team. Erin, along with her Deaf and hearing co-workers are continually inspired to positively influence, educate and interact with people, of all ages and all abilities.